Leading Manufacturer of upvc pipes 1/2" sch 80, upvc pipes 3/4" sch 80, upvc pipes 1" sch 80, upvc pipes 1.1/4" sch 80, upvc pipes 1.1/2" sch 80 and upvc pipe 2" sch 80 from Jamnagar. Backed by a team of dexterous professionals, we are engaged in trading a wide range of Supreme 0.5 Inch UPVC Pipes SCH 80. Our skilled personnel manufacture these pipes by utilizing quality assured poly vinyl chloride and advanced technology in sync with the industry standards. The provided pipes are used in varied constructions industries for various specific purposes. In order to deliver defect free range to our client's, these pipes are rigorously tested by our quality controllers. Owing to our affluent knowledge, we are involved in providing an extensive range of Supreme 0.75 Inch UPVC Pipes SCH 80. The offered pipes are provided to our customers in different specifications at industry leading prices. Backed by a team of dexterous professionals, we are engaged in trading a wide range of Supreme 1" Inch UPVC Pipes SCH 80. Our skilled personnel manufacture these pipes by utilizing quality assured poly vinyl chloride and advanced technology in sync with the industry standards. The provided pipes are used in varied constructions industries for various specific purposes. In order to deliver defect free range to our client's, these pipes are rigorously tested by our quality controllers. Backed by a team of dexterous professionals, we are engaged in trading a wide range of Supreme 1.1/4" Inch UPVC Pipes SCH 80. Our skilled personnel manufacture these pipes by utilizing quality assured poly vinyl chloride and advanced technology in sync with the industry standards. The provided pipes are used in varied constructions industries for various specific purposes. In order to deliver defect free range to our client's, these pipes are rigorously tested by our quality controllers. Backed by a team of dexterous professionals, we are engaged in trading a wide range of Supreme 1.5 Inch UPVC Pipes SCH 80. Our skilled personnel manufacture these pipes by utilizing quality assured poly vinyl chloride and advanced technology in sync with the industry standards. The provided pipes are used in varied constructions industries for various specific purposes. In order to deliver defect free range to our client's, these pipes are rigorously tested by our quality controllers. 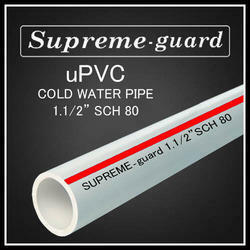 Backed by a team of dexterous professionals, we are engaged in trading a wide range of Supreme 2" Inch UPVC Pipes SCH 80. Our skilled personnel manufacture these pipes by utilizing quality assured poly vinyl chloride and advanced technology in sync with the industry standards. The provided pipes are used in varied constructions industries for various specific purposes. In order to deliver defect free range to our client's, these pipes are rigorously tested by our quality controllers.